Surely no one can disagree with the title I chose for the latest cake I made? I came across this cake a few months ago and thought it to honestly be one of the prettiest cakes I’d ever seen! There was even a tutorial on how to achieve this masterpiece. I stored all this information mentally, knowing one day I would have to make that cake. Well that day arrived last week! It was my favourite 10-year-old girls birthday. Along with her two brothers, I have looked after this little girl since she was born. The last 12 years of my life not only have flown by but have been filled with these three wonderful children and what a blessing it has been. Sandwiched in between the two boys is Minnie, the sunshine of my life. That gorgeous birthday cake was my project for her 10th birthday cake. Although I love baking, fancy cakes are not really my forte, I do like the cakes I make to look nice but I possess neither the patience or steady hand required to make delicate icing decorations. 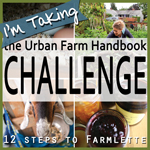 So this was a challenge for me! Prior to making the cake I made up a batch of buttercream and following the tutorial video I practiced piping roses onto baking paper. I recommend doing this, if like me fancy icing is not usually your thing. 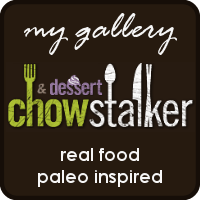 On i am baker’s crusting buttercream page there are a lot of comments about changing shortening for butter. 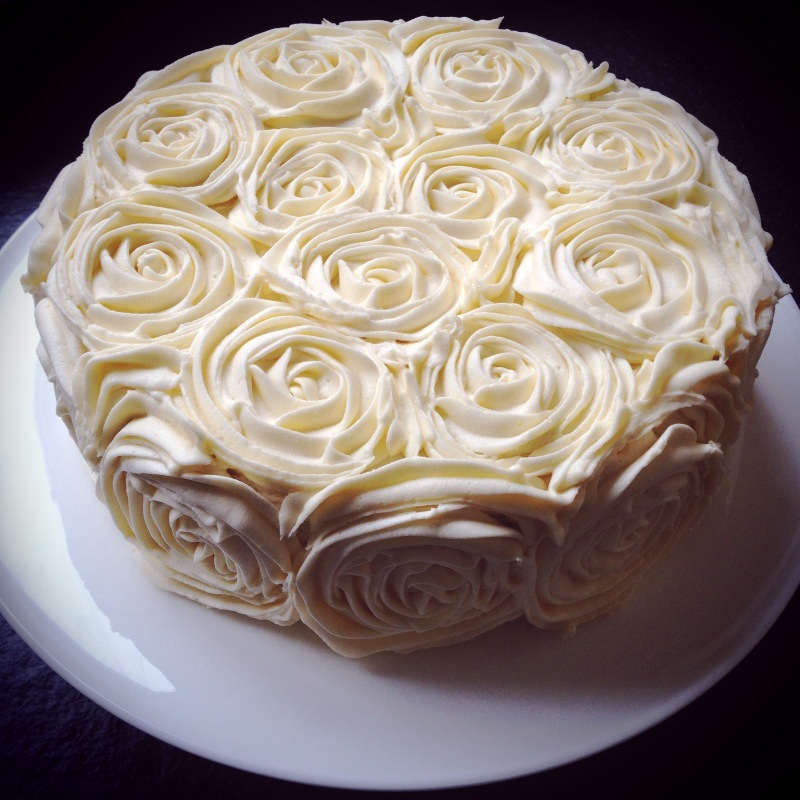 Concerns over melting and whether the butter would be able to hold its shape were worrying, but I have a problem with cakes that look nice but don’t taste nice and the thought of eating and feeding to the children raw shortening was not even a consideration so I made my roses with buttercream. It was a fairly warm day, at one point the kitchen got up to 25 c but the buttercream held its shape and even a couple of days later the last piece looked fine despite just been kept covered on the counter. So maybe if you live in a really hot climate and aren’t in an air-conditioned room butter may not be suitable but for me butter was no problem at all and definitely tastes better than shortening! I made the sponges the day before I intended on decorating them, using Delia Smith’s basic sponge recipe. The buttercream I made on the day. I separated a little of the buttercream and mixed in some purple food colouring which I used to sandwich the two sponges together. I liked the idea of making the vertical layers seen on i am bakers blog and one day I will but for this time it really was too much for me to attempt along with the roses! So I settled on just adding a little colour to the buttercream in the middle of the cake. When the cakes were sandwiched together I gave them a thin coating of buttercream, spreading it as smoothly as possible. 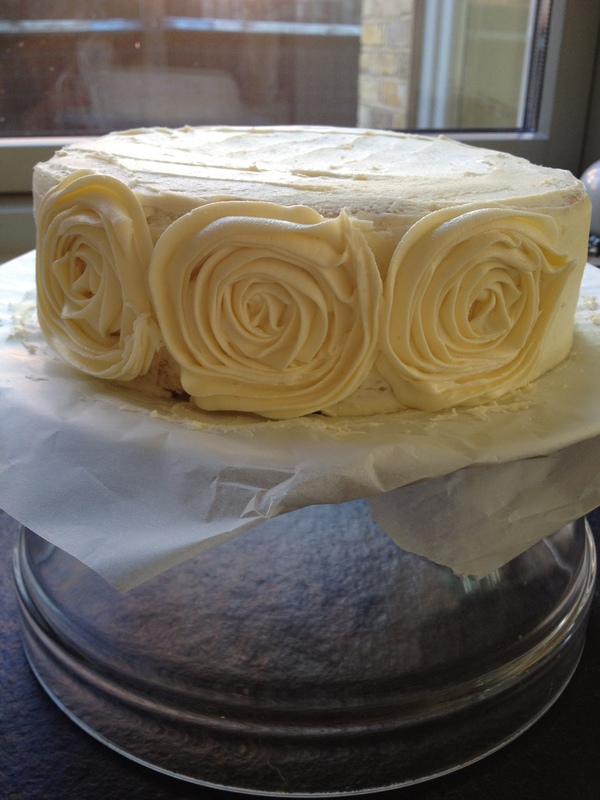 I then put the cake into the freezer for 30 minutes, this was an important step for me as it allowed any roses that I wasn’t happy with to be easily scraped off without damaging the crumb coat. It also allowed me time for a much needed coffee! To decorate with the roses I started on the side of the cake then did the top. This really gets easier as you go along, after the first 3 roses I knew it was all going to be ok and relaxed, getting speedier at piping the roses. I was delighted with the results of this cake! It really wasn’t difficult to decorate, the tutorial video is brilliant, if I can do this then anyone can! This was a wonderful cake for visual impact but importantly it tasted good too, and the birthday girl? After blowing out the candles and staring at the cake for a while she turned to me and said ” I love you”. I used this recipe from Delia Smith but instead of using a 7 inch cake pan I used an 8 inch cake pan and put all of the cake mix into it, I then repeated this, resulting in 2 larger sponges. I decided not to double up the ingredients as I’ve heard that by doing that you may get a heavier cake. So I made one sponge and while it was baking I prepared the other one. I based the frosting on this recipe from i am baker, it is sweet and there is a lot but I wanted to be sure that I had enough for any mistakes! This makes more than enough, with some left over. I tried to keep it slightly drier by adding less butter and milk than the recipe which seemed to work well for me. Using a mixer or food processor cream together the butter and vanilla until well softened. Add the milk a little at a time when the mix becomes too stiff. It’s the Jubilee weekend! I have had all year to plan what to make but in typical Jayne style I left it until the last-minute! The rest of my life is fairly organised, I’m a lover of lists but for some reason when it comes to cooking I’m more relaxed and often do things at the last-minute, quickly flicking through one of my cookery books minutes before going to the supermarket looking for something new to try. If you come to dinner at my house you will most likely be served a meal that I have never made before! For the Jubilee weekend I wanted to make a cake, something traditional, something with a royal tone. I decide to make a Victoria sponge, strangely a cake that I don’t make all that often, I do like it, it’s just often overlooked while I’m trying other recipes, so many cakes so little time! 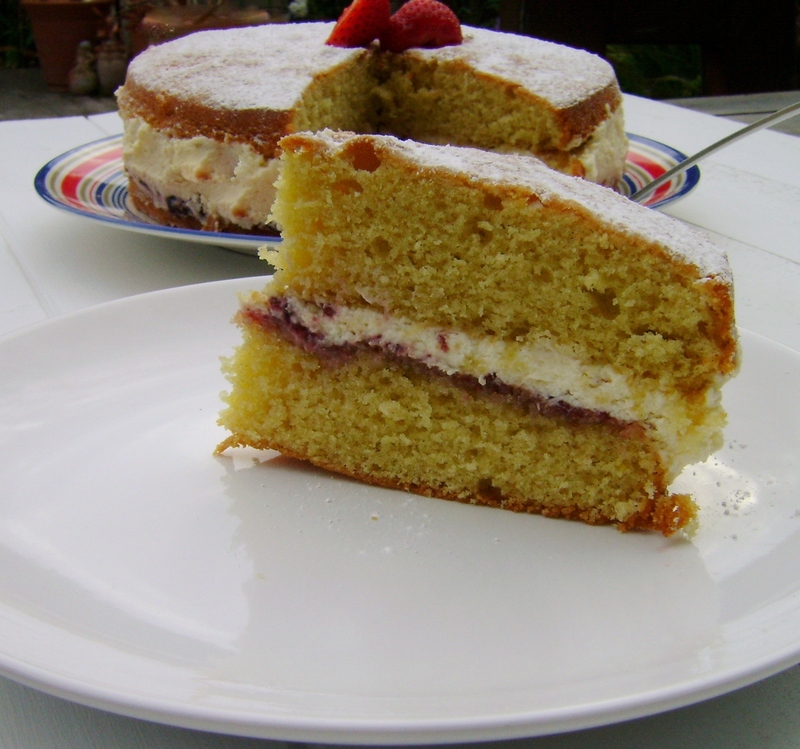 The Victoria sponge is indeed named after Queen Victoria and was apparently created by her lady in waiting, the Duchess of Bedford, who is also said to have started the English afternoon tea tradition. 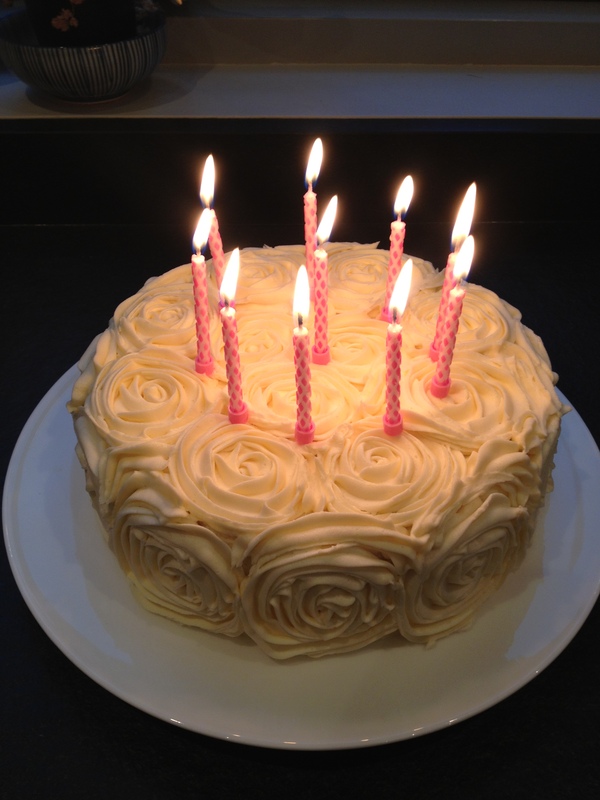 It seemed fitting then that I celebrated the Diamond Jubilee with a cake that was originally made for a Queen! 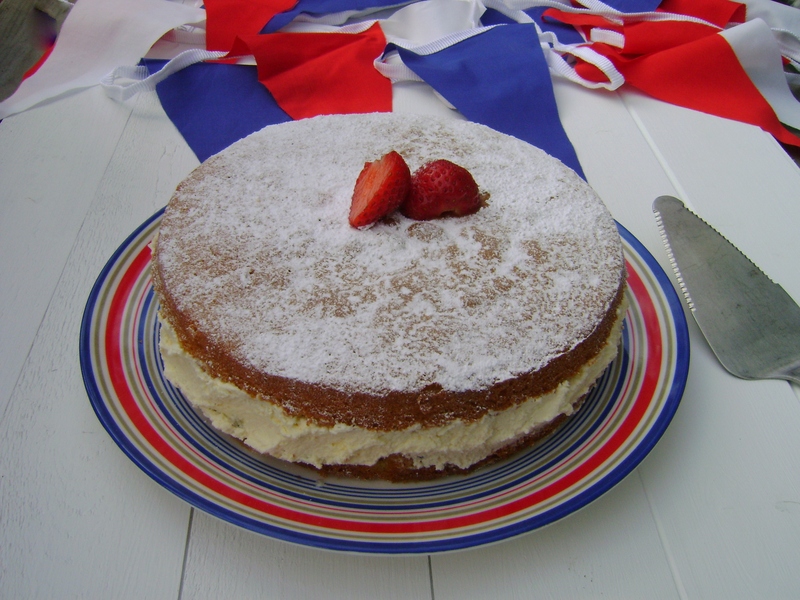 This recipe is the one used by my friend Pearl, she makes a wonderful Victoria sponge, her cake rises so well and is wonderfully light. Where Victoria sponge is concerned I think the recipe is pretty standard. Traditionally the filling was just jam but I wanted something a little more fancy so added cream, decadence seemed the order of the day! 4 tbsp Jam, I used jumbleberry but any berry jam would be nice. 300 ml Double (heavy) Cream, whipped. Careful not to over whip as I did! Preheat oven to 180 degrees C, 350 F, Gas mark 4. Grease and line 2 8 inch round baking tins. Cream together the sugar and butter until fluffy, I use a stand mixer but a wooden spoon and elbow grease works just fine! Add an egg, mix to incorporate, repeat with another egg mix and repeat until all the eggs are used. Add half of the flour, mix in gently add the rest and mix in gently, do not over stir at this point. Gently stir in the milk. Divide the mixture between the prepared cake tins. Allow cakes to cool in their tins then carefully remove. Remove baking paper. Spread the jam onto one sponge half, followed by the cream. Sandwich the cakes together a sprinkle with icing sugar.